We are hoping to open a BEAVERS colony for the younger children aged 6 – 8 soon, if you think you would like to help with this, please do get in touch. Cubs are aged between 8 and 10½, although we can take them as young as 7½ and we meet at our Scout hut in Marden every Wednesday during term time from 6.30pm – 8.00pm. Scouts are aged between 10½ and 14 and meet at our Scout hut in Marden every Friday during term time from 7.15pm – 8.30pm. If your child would like to join the adventure, please do get in touch. We have children in our group from a wide variety of local schools and local areas including Marden, Sutton St Nicholas, Bodenham, Burley Gate, Westhide, Lyde, Shelwick, Munstone & Crosskeys. Come and join our friendly group. In a useful and rewarding hobby. Contact Vic or Jenny 01568-797545. We are a friendly, welcoming club of mixed ability, and have been in existence for around 30 years. We welcome new members, of ALL standards and are recruiting now for 2011. There is currently NO Membership FEE, just pay to play. We play Badminton in the Parish Hall in Bodenham. We have one badminton court. Please note, only trainers may be worn. We hold club nights every Wednesday from 8.00-10.00pm. Just pop along or phone for more info. Please note that to play, you will need to bring your own badminton racquet. A charge of £3 per adult is payable. 28 years ago a group of Bodenham residents got together and started the Bodenham Bowling Club, which enjoys a wonderful village club atmosphere and location. We have an enviable reputation as a friendly club. The Bowling Club has 4 rinks. As a small club we welcome both new bowlers who have never bowled before and experienced bowlers. Just turn up with flat shoes or plimsolls and we will provide bowls and give you some tuition. The green is open from late April until the end of September with the rinks being available (subject to matches, competitions, etc.) from 2.30pm until dusk - weather and greenkeeper permitting. The Club plays matches against other local clubs home and away. These are all friendly mixed fixtures. (Follow the 'Events' link above). In addition, members are encouraged to play in the Club’s internal competitions. The green re-opens on SATURDAY 13th APRIL at 14.00 and this will be followed , as is our custom by a bring and share tea. If you have never tried the game why not come along and give it a go. We have woods that can be borrowed and so apart from FLAT soled shoes you will be ready to have a go. Bodenham Carers Group meets on the 3rd Monday of the month at the Siward James Centre 2.00pm -3.30pm. Click on the 'Events' link above to see a list of forthcoming meetings and other events. All family/ unpaid carers are welcome to come along and find out what support there is for you as a Carer, or just come and meet others. A Carer is someone who provides unpaid support to a family member, partner, child, friend or neighbour who may be ill, frail, elderly, have a disability or long-term health issue or mental health issues. Perhaps you don’t think of yourself as a ‘Carer’. You may see yourself as the mother, father, husband, wife, son, daughter or friend of someone who needs care, simply trying to do your best for someone you love, or perhaps doing what no-one else can or will do. There is support available for you. There are huge pressures on Carers - the biggest having so little control over your own life. No-one is super-human and all Carers need help, support and back-up at some point. If you’re not sure what kind of support you need or whether you need support at all, please get in touch with Helen Whitmore at Herefordshire Carers Support on 01432-356068, or email helenwhitmore@herefordshirecarers.co.uk (but see the changes announced below). In October 2018 the Council awarded a five year contract for a carers service to Carers Trust 4All – obviously very disappointing for Herefordshire Carers Support which has provided a first class service for over 20 years. From 1st April 2019 the new provider will take over service provision, but HCS has been able to retain a small pot of money to provide things outside the council contract – some training, trips and gettogethers, group support and the free counselling service will continue until the funding runs out. The HCS number 01432-356068 will continue for 3 months and will give details of the Carers Trust 4All number once it is operational. You can find out more from their website https://www.carerstrust4all.org.uk/. The Club was founded 30 years ago and at present has about 80 active members. Membership costs £10.00 per person per year and we meet at 7.30 pm on the first Tuesday of each month at the Parish Hall. These are very social evenings and we have a great deal of fun. Meetings usually consist of a talk or demonstration of some kind (not always gardening related; we've had cider and chocolate tasting and visits by owls for example). This is followed by light refreshments of tea/ coffee and home made sandwiches. We have a "Bring and Buy" sales table with surplus seedlings, produce, plants and other garden related items according to season. We also have a raffle and a monthly "Best Bloom" competition. Points are awarded for each bloom entered and the winning member is presented with a prize at our A.G.M. in October. Our meeting in March includes our Daffodil Show, a lovely harbinger of spring. In May we have a big plant sale when we all stock up on supplies for our hanging baskets, window boxes and patio containers. 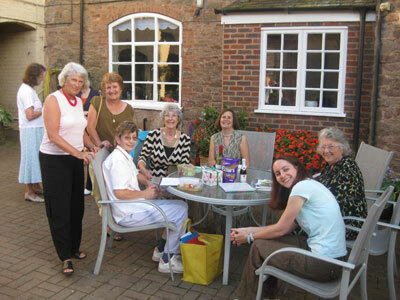 Our July meeting is held outdoors when members or friends welcome us to their garden to enjoy savoury snacks, a glass of wine, strawberries and cream and of course great company. On a Saturday in August we have our annual Flower and Produce Show which is open to all residents of the village. Funds provided by the raffle and the sales table help to subsidise a very enjoyable and extremely delicious Christmas Party in December. We spend the Christmas holiday mulling over our seed catalogues and usually manage to place such a large collective order to Dobies that we are granted a 52% discount on each packet of seeds. This gets the new gardening season off to a cracking start once more. The Club began 37 years ago and still meets twice a month, on the 2nd and 4th Monday of each month, at 2.30pm in Bodenham Parish Hall, or at 1.00pm when we serve a lunch. Our programme is varied and includes talks, slide presentations, lunches, teas, bingo, quizzes, garden party and outings. At the meetings in the Parish Hall we have a Bring and Buy Table, Raffle and light refreshments. Membership is £10 per year and visitors are always welcome at £1 entry. A higher charge applies when a lunch is served. For catering arrangements it is necessary to have numbers beforehand (see relevant telephone numbers below). Thank you. For further information please contact the Chairman, Mrs. Gwenllian Bowden on 01568-797868. With more than 3.6 million members in 78 countries, the aim of the MU is to demonstrate the Christian faith in action by the transformation of communities through the nurture of family life. Membership is open to both men and women who have been baptised. Visitors are always welcome at any of our branch meetings. Unless otherwise stated, meetings will be at 10.30am on the first Thursday of the month, at 14 Brockington Road, Bodenham. The Club was founded in 1980 following a parish circular inviting residents to indicate their interests. There were 12 founder members and the Club was initially affiliated to the Ramblers’ Association. However, membership of the Association was not renewed in 1982. This was because many members were not happy with the more militant attitude that was being adopted by the Ramblers Association as it was seen to conflict with our own policy of cooperation with landowners. This policy remains current and individual members are free to take out personal membership of the R.A. if they so wish. Many of the footpaths and stiles in the 7 parishes from Munstone to Pencombe owe their reinstatement and continued existence to the Bodenham Ramblers Working Party (or Geriatric Playgroup) which was in operation between 1989 and 2000. During this period Bodenham Ramblers restored some 35 miles of rights of way, erected 75 signposts, built 142 stiles, 13 footbridges and installed 11 kissing gates. Since then, the purpose of the Club, to ramble, has continued apace, attracting more and more walkers until non-resident members now outnumber those living in Bodenham. As many of our members are retired, our walks are programmed on a ten-day cycle of Sundays and Wednesdays. Walks during the summer season are approximately 7-8 miles with a picnic lunch, whilst the winter programme involves walks of 4-5 miles finishing at a pub for lunch. In May each year the Club organises a 3-4 day walking holiday. To date we have had several successful walking holidays in St David’s, Wales, North and South Devon, Cornwall, Llandudno & Tenby. Our AGM is held in the Parish Hall in early Spring each year. The meeting is followed by an opportunity to enjoy refreshments and review the year’s activities with fellow members. It also provides time to look at some of the photographs taken during the past 12 months, some of which will no doubt raise a few smiles. This turns the evening into a pleasant social gathering usually attended by up to 40-50 members. A social membership at a reduced subscription was introduced to accommodate members who were no longer able to walk, but wished to keep in contact with club members and their activities. At present full membership is priced at £3 per annum and social membership at £1. We are a friendly family orientated club situated behind the Parish Hall in Bodenham. We have two newly re-surfaced courts, one of which is floodlit. We welcome new members, of ALL standards. Membership includes your own key for access to the courts and you can use the courts as often as you like. Please note that if you invite visitors to join you to play, a charge of £2 per adult and £1 per junior is payable. Unfortunately the activities of the Bodenham WI are suspended for the time being. However, enquires have been made about re-forming the Branch. Brenda Drake is the WI Adviser for Herefordshire Federation of WI and she would like to hear from any ladies interested in re-forming the WI here. She hopes to hold a public meeting in the Autumn for a discussion, but would like to gauge interest beforehand. Give her a call on 01432-356653. If you can't reach her on that number, call the WI office on 01432-272268 and someone there will be able to help. If any lady or group would like to organise an event for the 2018-19 calendar, please contact Lyn on 01568-797228 for the details to be included in the monthly newsletter and on the parish website. For membership details phone our Treasurer, Anita Griffiths, on 01568-797929 or any of the contacts below. Subscriptions are now £1.00 per annum. Herefordshire Carers Support believes that Carers should be proud of the valuable work they do and that they deserve a little extra in recognition of that role. Many other organisations agree and offer concessions for Carers. However businesses often ask to see proof in order to access their discount. Not everyone can do this easily and some Carers miss out on this entitlement. This is especially true when you are caring for someone who does not have an obvious disability. The ‘I Count’ Card, issued by Herefordshire Carers Support, provides Carers with an easy way to identify themselves as Carers. It is the same size as a credit card and fits easily into a wallet or pocket. It entitles Carers to discounts from some local suppliers such as Halo Leisure, the Yeleni Support Centre, and Kidwells Solicitors to name but a few. The ‘I Count’ Card has also been used by Carers accompanying the person they care for, to get in free to various local and national attractions such as The Courtyard, Hereford, National Trust properties and the London Eye. Are you a Caring and Sharing person? Are you 11years old and over? Are you looking to join with friends & activities during holidays? Are you prepared to help with fund raising? Are you keen to help others? We meet on the 2nd and 4th Wednesdays in the month at 7.00pm. Bring your favourite poetry along. If you are shy about reading out loud, don’t worry, one of us will read for you. The sound of an idea” Loy. Friday mornings (Term time only) at Bodenham Nursery, in St Michael's School. A Baby & Pre-school Children's group. Run by volunteers, a great place for mums to come for a tea or coffee while the children have a play. Children get a drink and biscuit and can play inside or outside in the play area on the warm sunny days. An occasional series of talks and slide presentations on a variety of topics including local interest and foreign visits. Admission £3.00 includes light refreshments. Dates usually announced in village news, Hereford Times and on noticeboards at the Post Office and the Chapel.